All it took was a couple of questionable calls for Novak Djokovic to snap at the chair umpire in the second game of his third-round match at Wimbledon. 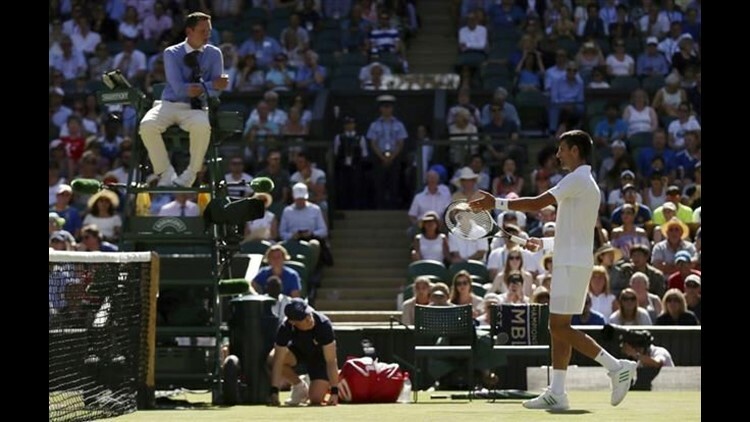 LONDON (AP) — All it took was a couple of questionable calls for Novak Djokovic to snap at the chair umpire in the second game of his third-round match at Wimbledon. "That's two points in a row at the beginning of the match," Djokovic said, before telling official Jake Garner: "Focus, please!" That would have been good advice for Djokovic himself. Maybe he was a bit on edge because this was the stage at which, as a two-time defending champion, he lost at the All England Club a year ago. On Saturday, Djokovic briefly fell behind by an early break before zipping past Ernests Gulbis of Latvia 6-4, 6-1, 7-6 (2) to earn his 10th berth in the tournament's second week. Right after his, er, conversation with Garner, Djokovic lost a service game to trail 2-1. He later fell behind 4-2 in the opening set. But from there, Djokovic used a nine-game run to seize control and wasn't broken again. "As soon as you give a guy like Novak the tools to step on the gas, he will step on the gas," said Gulbis, who has been a top-10 player and a French Open semifinalist but missed chunks of time because of injuries, dropping his ranking outside the top 500. "And he just goes, and he doesn't look back." Three of Djokovic's 12 major championships have come at Wimbledon, and after a real dip in results over the past 12 months, he has not dropped a set so far this fortnight. "That only can boost my confidence level," the No. 2-seeded Djokovic said, "for whatever is coming up next." After the grass-court Grand Slam tournament's traditional middle Sunday off, he will face 51st-ranked Adrian Mannarino of France for a place in the quarterfinals. All 16 fourth-round singles matches are scheduled for Monday — Wimbledon is the only major that does it that way — including these in the bottom half of the men's draw: No. 3 Roger Federer vs. No. 13 Grigor Dimitrov, a guy nicknamed "Baby Fed" because of his similarities to the seven-time Wimbledon champion; 2016 runner-up Milos Raonic vs. No. 10 Alexander Zverev; and 2010 runner-up Tomas Berdych vs. No. 8 Dominic Thiem. Federer, like Djokovic, has won every set he's played this week, including Saturday's 7-6 (3), 6-4, 6-4 win against No. 27 Mischa Zverev, Alexander's older, left-handed, serve-and-volleying brother. "It's important to get through the first week with a good feeling," said Federer, who compiled hard-to-believe official statistics of 61 winners to a mere seven unforced errors, "and I think I got that." The result made Federer the first man to get to 15-0 in third-round matches at Wimbledon. Other than a nifty back-to-the-net 'tweener from Federer, it also was a perfect example of what a relatively straightforward, little-drama day it was. The matchups on the top half of the men's draw are defending champion Andy Murray vs. Benoit Paire, two-time Wimbledon winner Rafael Nadal vs. No. 16 Gilles Muller, No. 7 Marin Cilic vs. No. 18 Roberto Bautista Agut, and No. 24 Sam Querrey vs. Kevin Anderson. Women's fourth-rounders: five-time champion Venus Williams vs. No. 27 Ana Konjuh, No. 1 Angelique Kerber vs. No. 14 Garbine Muguruza, No. 2 Simona Halep vs. two-time Australian Open champion Victoria Azarenka, French Open champion Jelena Ostapenko vs. No. 4 Elina Svitolina, No. 6 Johanna Konta vs. No. 21 Caroline Garcia, No. 7 Svetlana Kuznetsova vs. 2012 runner-up Agnieszka Radwanska, No. 5 Caroline Wozniacki vs. No. 24 CoCo Vandeweghe, and Magdalena Rybarikova vs. Petra Martic. After completing his career Grand Slam by winning last year's French Open for a fourth consecutive major title, Djokovic went through some struggles, including his upset loss to Querrey at Wimbledon. A series of changes followed, including a split with coach Boris Becker and other long-time members of Djokovic's entourage. He enlisted Andre Agassi's unpaid help for part of this year's French Open. Now they've been joined by another former player, Mario Ancic, who sat next to Agassi in a guest box at Centre Court on Saturday. "I'm glad to have them both," Djokovic said. "I think they contribute in their own way to my game. But most of all, there is great chemistry, great synergy, great understanding, respect for each other." Asked about telling the chair umpire to "focus," Djokovic smiled sheepishly before responding, "Well, I think he's probably frustrated with me saying that. Maybe it was not the right words to say. I apologize." Djokovic called it "very odd" that there were two rulings so early that he disagreed with. "He's trying to do his job the best that he can. I am, too. Sometimes, in the heat of the moment, you exchange things," Djokovic said. "But I think we'll be fine."